St. Patrick’s Day holds a special place in my heart. It was on St. Patrick’s Day 10 years ago that my husband and I had our first date. 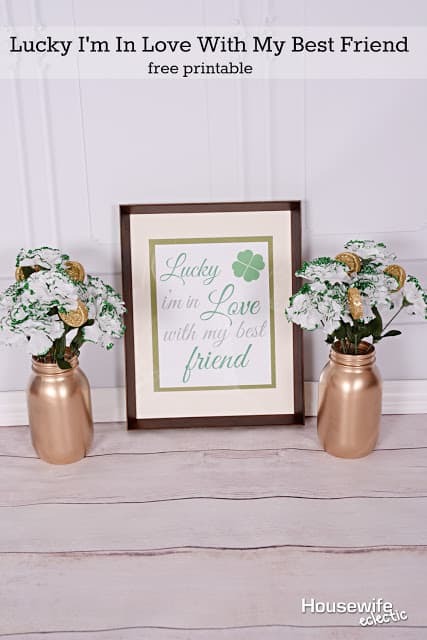 I feel extraordinarily lucky to have found him all those St. Patrick’s Days ago and today I am sharing a printable that shares that sentiment. I love the song Lucky by Jason Mraz and Colbie Caillat and wanted a printable of my favorite line from the song. The printable prints on an 8.5×11 piece of paper and then has a border for you to trim down so it easily fits in an 8×10 frame. 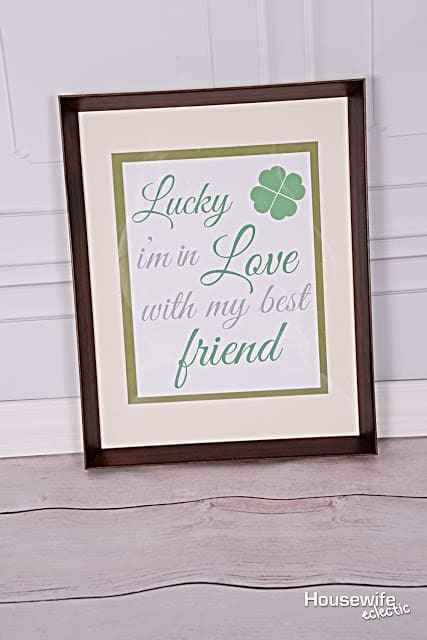 This sweet printable hangs out on my piano from after Valentine’s Day through St. Patrick’s Day. Download the printable below. Love the sentiment and I'm very fortunate that it's true for me too. Great printable. This is so cute! I love that it doesn't involve kissing since so many people use that for St. Patrick's Day haha. It kept with the theme but went a different route and I love it. You guys are so cute and I love that you are still madly in love all these years later. ST Patrick's day is a momentous event and it is nice that you met on the day. Cute printable and love the quote! This is so sweet!!! I love decorating for St. Patrick's Day and celebrating our Irish heritage! This is so sweet. I really love how you styled the print with the mason jars. What a cute printable.I also love that song. How cute that you had your first date on St. Patrick's Day. Thank you! I love this printable and will be printing it for my hubby! We both love to celebrate our Irish heritage and even enjoyed a wonderful trip to Ireland a couple of years ago. Love this printable and now the song will be stuck in my head all day. Have a great St. Pats! I never know how to use printable a but this is a good way of using them. The song just goes with the printable. Very well chosen and thought of! Congratulations! Stay blessed! Aw I love this cute little phrase! I think its in a jason mraz song too, which I love. It's very cute! My hubby would be so sweet about it if I put this up. He'd love it. Thanks for sharing at Merry Monday. Pinning to the Merry Monday party borad.